Precious metals futures mostly gained Wednesday. Increases in gold and silver were their first in four sessions and follow their almost two-week lows. Palladium ended near a new record. Platinum was the decliner. Gold for December delivery tacked on $10.20, or 0.8%, to settle at $1,223.60 an ounce on the Comex division of the New York Mercantile Exchange. 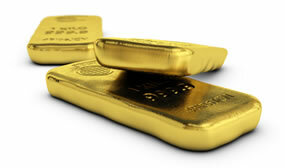 "Gold should stay fairly range-bound in the short term," Reuters quoted ING analyst Warren Patterson. "I struggle to see it breaking below $1,200 and likewise on the upside, until the end of this year, I struggle to see it breaking above $1,250 as well." Gold futures ranged from a low of $1,210.50 to a high of $1,227.70. They lost 0.7% on Tuesday — ending at their lowest price since Nov. 14, and they dipped less than 0.1% on Monday. Elsewhere, silver for December delivery advanced 24.1 cents, or 1.7%, to settle at $14.325 an ounce. Silver futures traded between $14.07 and $14.36. They declined 0.9% on Tuesday — also ending at their lowest price since Nov. 14, and they fell 0.3% on Monday. January platinum lost $9, or 1.1%, to $826.30 an ounce, ranging from $816.50 to $837.40. Palladium for March delivery jumped $29.80, or 2.7%, to $1,151.90 an ounce — $2.70 lower than the record set on Nov. 16. Palladium prices traded between $1,125 and $1,161.10. Gold declined $7.95, or 0.7%, to 1,213.25 an ounce. Silver fell 12.5 cents, or 0.9%, to $14.15 an ounce. On Wednesday, the United States Mint published bullion sales gains for the first time in more than a week. The single reported 80,000-coin increase belongs to a five-ouncer. A CoinNews photo of a Block Island quarter. 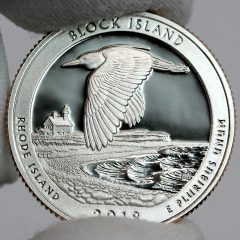 The U.S. Mint started accepting orders for its 5-ounce Block Island America the Beautiful Silver Bullion Coin. It shares the quarter’s designs. Released Monday for sale to U.S. Mint bullion distributors, the new Block Island piece is the last of five 2018-dated 5-ounce America the Beautiful silver bullion coins. 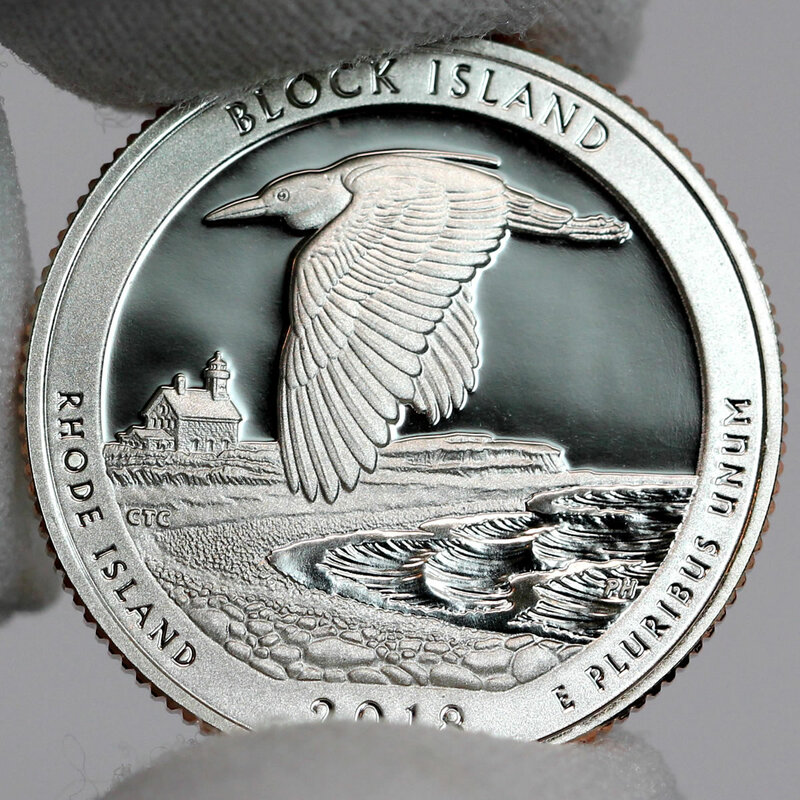 It depicts Block Island National Wildlife Refuge in Rhode Island — just like the companion quarter released over two weeks ago. The 80,000 total is the most in the series since the first issues released in 2016.